ONYX Hospitality Group has assumed management of a 105-room hotel on Hainan Island in China as the company seeks to expand its Amari brands into the country. Owned by local developer, Sanya Daxing Group, the existing property will continue to operate as an upscale boutique offering while it undergoes a phase of re-branding before debuting as the Amari Sanya Bay on March 1st 2012. The centrepiece of the ONYX portfolio of brands, Amari properties reflect modern Asian hospitality, embodying Asian flair, modern perspective and a down-to-earth vibe. ONYX president, Peter Henley, said: “We are delighted to be working with Sanya Daxing Group which has considerable experience in property development on Hainan Island. 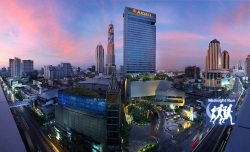 "This inaugural Amari-branded hotel in China is a significant milestone in ONYX’s strategic development,” Henley added. Located just 20 minutes from Sanya Phoenix International Airport, the 11-storey property features well-appointed rooms with balconies, all offering panoramic views of Sanya Bay. Facilities will include an elegant below-ground Chinese restaurant, a Thai restaurant with two dining salas, a clubhouse on the waterfront, a spa and an outdoor swimming pool with poolside bars. Chairman Zhang Hai Lin of Sanya Daxing Group noted: “We look forward to a long and fruitful partnership with ONYX Hospitality Group.